Read on for a list of fun things to do in Coronado Island, San Diego's major attraction! When visiting San Diego, you cannot miss out on a trip to Coronado Island. This short, 15 minute ride across the Bay will delight with its scenic views and fun vibe. Ferries leave regularly on the hour and on the half hour from Broadway Pier and the Convention Centre. When you arrive, you can shop up a storm at the Waterfront Marketplace and then set off to explore. Enjoy a theatre experience and a walk in a glorious Park. Ride a Segway to see the sights, walk or bike. The beaches are rated amongst the top 10 in the world, with swimming, surfing and kayaking opportunities. Enjoy a romantic gondola ride and explore an historic old Queen Anne style wooden Hotel that was featured in famous movies. 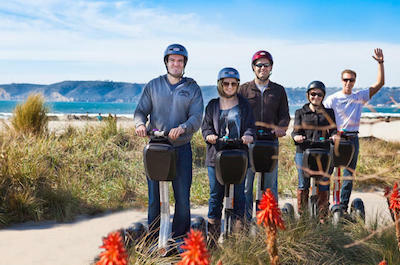 Explore the Island on a Segway. 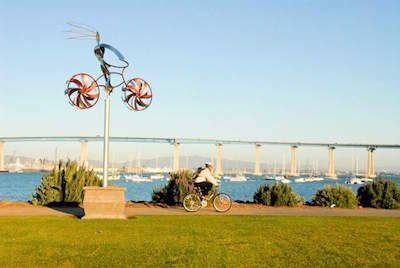 If you have never ridden one before, this is the first thing to do in Coronado Island. These fun two-wheeler bikes are easy to use and suitable for all ages and levels of fitness. Simply stand, lean forward and off you go! Your guide will give you a quick lesson and safety briefing and soon you will be zooming around enjoying the sights. Meet at the Gaslamp Quarter and head out into the streets of San Diego. At the Port, you will board a ferry with your Segway and sail to Coronado Island. Ride around and enjoy this pretty resort community. See the fancy homes in Glorietta Bay and the panoramic views of the Pacific Ocean. 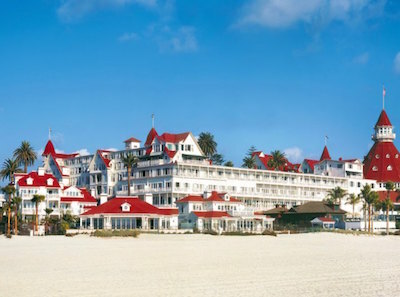 Pass the splendid Hotel del Coronado, a luxurious and historic beachfront resort. Keep your energy up with complimentary chips and bottled water while your guide gives you interesting bits of information about the Island. Then head back to the Port and return to San Diego. A fun thing to do in Coronado for the whole family! 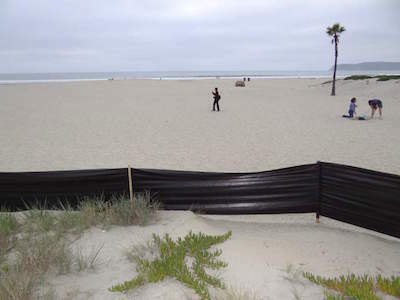 You cannot miss Coronado Municipal Beach, it is consistently rated in the top 10 American beaches. Planning to spend a day here is a fabulous thing to do in Coronado. The beach lies about 4.5 miles south of Coronado Village and offers warm, calm water, endless clean sands and ideal swimming conditions for families with children. The area features 4 different beaches, playgrounds for kids, grassy parks to relax and full facilities. You can walk or swim, learn to surf, fly a kite or play a game of volleyball. Take your dog for a run in the north section, it is pet friendly. The beach is famous for the Victorian wooden resort known as Hotel Del Coronado which was built in 1888. Celebrities, royalty and presidents have spend time here including icons like Marilyn Monroe and Madonna. This Hotel is a National Historical Landmark and featured in the movie Some Like It Hot. Set up on the sand under a swaying palm tree, as evening falls, you will be treated to a magnificent sunset. Sailing in a gondola may not sound like a thing to do in Coronado, but think again! 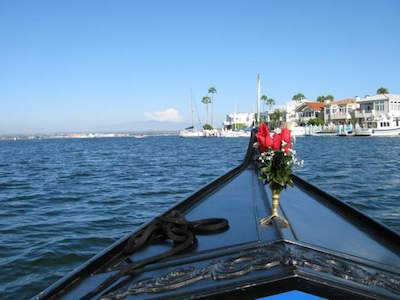 The canals of the Coronado Cays are filled with romantic gondolas in the traditional style of Venice, Italy. Cruise along the water with your private gondolier, sipping champagne as twilight sets in. The cruises are ideal for small groups or couples. See the old buildings on the water front, wave at passing boats and snuggle up under a blanket if the weather turns chilly - a perfect way to celebrate a special occasion. If you are a wine lover, join a unique wine tasting tour. You will sample and learn about six different wines under the guidance of expert sommelier Kurt Kirschenman. Delectable chocolate truffles are also on offer! If you have a large group, you can arrange a fleet cruise, where up to six gondolas will sail side by side, an awe-inspiring thing to do in Coronado that will create memories to last a lifetime. The iconic Hotel Del Coronado has been visited by royalty, celebrities and super stars. Marilyn Monroe, Brad Pit and Madonna are some of the famous names that have graced its halls. The Hotel has been the setting of many movies including Some Like It Hot and is listed as a National Landmark. Enjoy a 90 minutes guided tour of this awe-inspiring venue. The tours take place every Monday, Wednesday and Friday at 10.30am and on weekends at 2pm. You will walk through this magnificent Hotel and learn all about its rich history. Built from all wood in 1887, in a Queen Anne style, it is the 2nd largest wood structure in the USA. When it opened in 1888, 1440 residents travelled across the Bay to spend the opening night in the 399 rooms, eat in the lavish banquet areas and stroll in the landscaped gardens. Learn about the yacht club, the Olympic size pool, the bowling alleys and Japanese tea garden. Hear spooky stories about a suicide and a drowning, the ghosts still walk these corridors! A fun things to do in Coronado for the whole family! Looking for another paradise beach to explore? Setting off to Silver Strand State Beach is a great thing to do in Coronado. This magnificent setting lies five miles south of the Coronado Municipal Beach and offers a long, narrow clean beach with calm, warm water. Here you can relax and enjoy a host of activities. There is surfing, boating, kayaking and water-skiing. You can play a game of volleyball with new found beach friends. Anglers can throw out the lines and catch corbina, perch and yellow-fin croaker. If you love biking, ride along one of the special bicycle paths that offer magnificent views of the Bay. Want to spend more time here? There are clean and modern RV camping areas with all the facilities you need. Set up for a few days and rejuvenate your soul. Silver Strand State Beach is known for its silvery oyster shells that cover the beach. Make sure you collect some to take home to treasure. Relaxing in a beautiful Park is another great thing to do in Coronado. 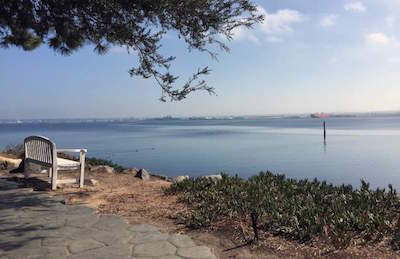 The Coronado Tidelands Park offers a small beach, open grassy fields and a delightful picnic area with great views of the Skyline and Coronado Bridge. Plan on spending a day soaking up the sun and rejuvenating your soul. If you want to get some exercise, bring along your bike and enjoy the special biking path that extends from the Silver Strand to the Old Ferry Landing. Kids will enjoy the playground with swings and slides. When you get hot, head to the little beach and take a swim in Glorietta Bay. The water is calm and warm, perfect for the elderly and small children. Ship lovers can sit on the sand and enjoy the scenes of naval ships docked in the harbor, loading and unloading goods. A perfect day away from the city, but close enough not to have to travel too far. After soaking up the sun on the beaches, the next thing to do in Coronado is visit the famous Lamb's Players Theatre. This historic venue began as a drama class in 1971 and today is known for its range of cultural activities. The Theatre presents an annual 5-play season celebrating the joys, strengths and diverse traditions of the region. New works and loved oldies are played to packed audiences in this small and intimate venue. The Theatre seats 350 people and is located close to the iconic Hotel Del Coronado. Depending on the current program you may get to see the famous WhoÕs Afraid Of Virginia Woolf or Westside Story. There are serious shows and fun musicals that the kids will love. The fabulous Lamb's Festival of Christmas is always a winner and will have adults and kids rolling in the aisles with laughter. Check the program for current and future events. When planning things to do in Coronado with the family, don't miss out on a visit to Spreckels Park. This magnificent Park offers 8 acres of landscaped gardens set under swaying palm trees. Take along a picnic basket and enjoy a relaxed lunch. Wander along the walking paths and enjoy the flowers. The main attraction is the vintage-style Gazebo Bandstand where concerts are held on a regular basis. Settle down on the grass on a picnic blanket with a glass of wine and enjoy the music on a warm summerÕs evening. The Park was donated to the city in 1927 by the founding fathers J D Speckles of Coronado and attracts both locals and tourists. Art lovers will enjoy the outdoor art shows promoting local talent. There is also an annual flower show, book sales and fabulous local crafts to look at or buy as a souvenir to take home. No dogs allowed! If you are looking for outdoor things to do in Coronado, you will be spoiled for choice. In the water and on the land, there are host of activities to take part in. Swimming, surfing, kayaking and body boarding are found on most of the beaches. If you have never surfed before, take a lesson to learn the basic skills, kids and adults are welcome. Kayak fans will enjoy the calm waters and stunning scenery on a relaxing trip around the bay. Biking around the city is another fun experience. Rent a bike or join a tour, you will see the main sights and learn all sorts of interesting facts from your guide. If biking is too much hard work, rent a fun golf cart and zoom around in style, it is safe and makes a great experience for the whole family! Golfers can play a few rounds at the lovely Coronado Municipal Golf Course and then the whole family can relax on the lawns of the Park and listen to a band play some great music. Heading to another Bayside Playground is a fun thing to do in Coronado. Glorietta Bay Park is located on Strand Way, close to hotels and tourists venues. The first thing you will love is the amazing view of the San Diego skyline, make sure you have your camera charged and ready! See the Bridge and the picturesque sail boats on the water. Stroll around the Park and soak up the relaxing ambiance. Enjoy a ball game with the locals and let the kids run wild on the grassy knolls. There is a fun playground with slides and swings to keep them busy. There are ramps for skateboarders, give it a try or just watch the pros in action. Walking is the thing to do here, take a brisk morning walk or a relaxed sunset stroll, both are equally as enthralling. For water lovers, enjoy the small beach with direct access to the Bay. Looking for more arts and culture? A visit to the Coronado Playhouse is an enlightening thing to do in Coronado. The Playhouse is the oldest and longest running community theatre in San Diego, established in 1946 in a school auditorium. The Playhouse has produced over 200 productions, sold out to locals and tourists. This intimate venue seats 100 people and offers a mix of classic and modern dramas, comedies, colorful musicals, spine tingling mysteries and more. Original works by local talent is encouraged. Enjoy iconic productions like The Little Shop Of Horrors, Fly By Night and Much Ado About Nothing. The children will love James and the Giant Peach, not to be missed! Check the calendar for the latest events for more things to do in Coronado Island and book in time. You can also take part in classes, talks and educational programs.